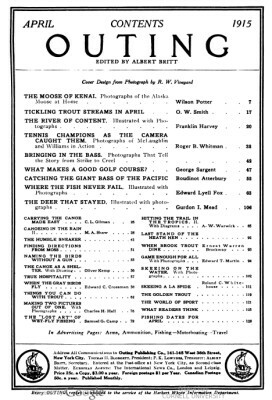 Outing Magazine : The Water Skee, 1915. [Moore, T. C.]: The Water Skee. This unusual craft was designed and ridden by T.C. Moore in California in 1914, as described at length in this article. This account notes that the blades of the propeller are sharp enough to cut seaweed and prevent any serious clogging. A briefer article was printed the previous year, identifying the inventor, in Popular Electricity and Modern Mechanics where the craft was named as a Swimming Skee. 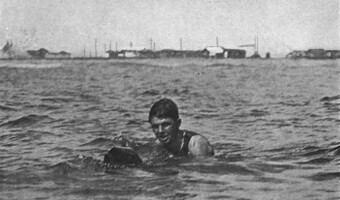 1914 T. C. Moore : Swimming Skee, California. The air tanks give buoyancy, the pedals furnish the power and the upturned prow prevents diving. OUT in California, a young inventor has developed what he calls a water skee for which great things are claimed. It is an idea that other men have played with, but he has carried it farther and really seems to have developed a fairly practicable device. The power is furnished by the legs of the swimmer, bicycle fashion, a small propeller being operated by direct drive. The shape it owes to the skee, the pedals to the bicycle, and the propeller furnishes its kinship to the motorboat. The skee measures some nine feet in length, and the board is ten inches wide. All the metal work, with the exception of the air-tanks, is bronze to prevent rusting in the water. These air tanks are of galvanized iron, painted with several coats of enamel. vents any chance of sinking or even capsizing, as they always force the machine to assume an upright position if it is rolled over in the waves. The blades of the propeller are sharp enough to cut seaweed and prevent any serious clogging. skee, and propels the pedals with his feet, much in the same manner as he would ride a bicycle. The addition of padded stirrups to keep the feet from slipping off the pedals while in the water makes it easier to ride. The speed is under perfect control, as well as the direction of the course. The latter is regulated by shifting the weight to one side, so as to throw the machine on its side, thus causing it to follow its own nose and make the turn with ease. Only a few minutes’ practise is said to be necessary to learn the trick of revolving the pedals with a circular motion, without any jerk or stopping at dead-center, and then the skeeist may attempt a few tricks, such as riding in a circle, on his back, or even backward, as the “engine” is readily reversible. The proper balance may be maintained by lying well forward and gripping the board near the tank or grasping the tank braces in both hands. In this way both tanks ride out of water, giving the best speed. It is well also to keep the head low in the water, and it has been found easiest to lie with the head on one side, one ear submerged in the water. 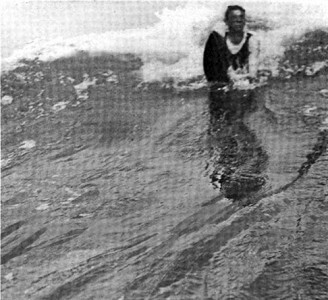 The skee is recommended as both a life-saving device and a pleasure craft, combining safety with novelty. It cannot sink; makes better speed than a swimmer, and does not tire the rider as swimming does. It is more practicable for long distances, and can go through water where there is a heavy undertow, as it sets so high in the water that it is not caught in the grip of the undercurrent as the legs of a swimmer are. It doesn’t take a long time to master, as the surf-board does; requires no skill in balancing and sticking on; and has the great advantage of being equipped with a motive power, whereas the ordinary surf-board must be pushed and paddled out to sea before it can be ridden in. The best sport with the skee is found in rough water - a lake, churned and thrashed by a heavy storm, or the breakers on the seashore. The keen pleasure of ﬁghting through pounding waves, of scaling the walls of mountainous rollers, towering an instant on their hissing crests, and dropping like a bomb on the other side; of feeling the sudden rush of tons of swirling, foaming water, yet knowing that safety lies in clinging to a bit of machinery - these are some of the joys of skeeing out through the breakers that the inventor offers. Geoff Cater (2017) : Outing Magazine: The Water Skee, 1915.